Blonde in this City: "Life is short. Live your dream and share your passion." 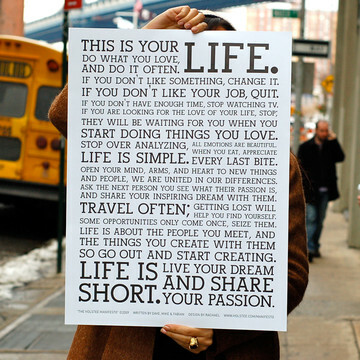 "Life is short. Live your dream and share your passion." A few months ago, I was on one of my favorite flash sale sites, Fab, when I stumbled across a poster for sale. It looked familiar, as it's circled the web on many a tumblr page before. It comes from a company called Holstee, founded by three men who weren't satisfied with their careers, quit their jobs, and put all of their energy into Holstee. They wrote their manifesto on the steps of Union Square, putting hopes and dreams and inspiration into words. You can read more about the company and their beginnings here. If those words don't inspire you, I don't know what could. I bought my poster from that first sale several months ago, and have a very set vision for how I want to mount, frame and hang it in my apartment that I just haven't had time to complete. In the meantime, though, I purchased another copy for my best friend who still lives back in Iowa-post college life can be rough as we try to figure out what we want to do and where we want to go, and sometimes we get lost. I found an amazing, one of a kind frame (that made me rethink my vision for my own!!) when I was at home and had glass, a matte and a back cut and surprised her with it last time I saw her. 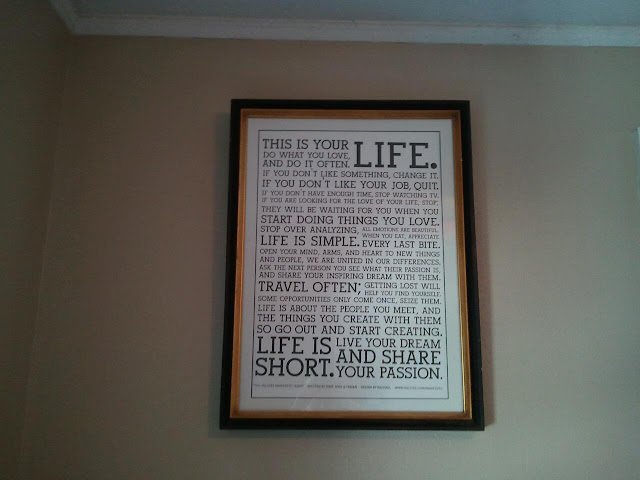 We immediately hung it in her apartment above her bed, where she sees it every morning when she gets up. It inspires me every time I read it and it feels amazing to share that inspiration with someone else. We spoke a few weeks ago (and pretty much every day since) and she told me about some changes she was looking to make in her life and the motivation she got to just go for it when she reads the poster. The best part is, today I can share that inspiration with all of you! Fab has the poster on sale again, and I ordered another one this morning for my mom. If you're already a member, you can view the sale here, and if you aren't yet, join first via this link! You save about $10 compared to ordering it regular price via Holstee.